Despite reaching a plateau in total U.S. vehicle sales, automakers and buyers remain bullish on higher-ticket items such as SUVs and pick-up trucks. 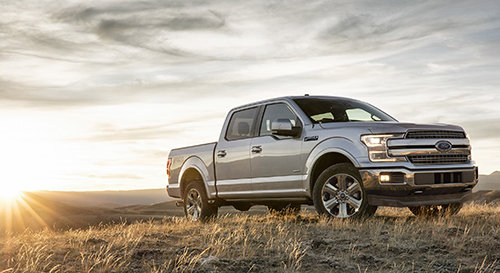 For example, in 2017, Ford’s F-series pick-ups netted their largest sales year since 2005. Photos in this article courtesy of Ford Motor Co.
With 17.2 million U.S.-new-vehicle sales in 2017, it appears that the predicted plateau has come to pass. For seven years, the automotive industry has rode an impressive wave, notching two consecutive record-sales years along the way, but 2017 ended with sales down 1.6 percent compared to 2016. This decline represents the first since 2009. But there’s some good news for automakers in these numbers: Higher-ticket, more-profitable vehicles such as sport utilities, crossovers and pickup trucks are in greater demand than ever. General Motors led in domestic sales, with 3 million in 2017, followed by Ford with 2.59 million. Confirming Americans’ on-again love affair with larger rides owing in large part to lower fuel prices, Ford’s F-series tallied its best sales year since 2005. Toyota, with 2.43 million sales, finished third in 2017 U.S. sales, and Fiat Chrysler, in fourth position, sold 2.06 million vehicles. In 2018, industry prognosticators see U.S. new-vehicle sales dropping below 17 million. That would be the first sub-17-million finish in five years. Uncertainty abounds, however, as sales may be impacted positively by recent tax changes and negatively from tariffs on steel and aluminum. Unwilling to boost sales via discounts and incentives, automakers thus far appear content to safeguard profit margins, especially with greater demand for higher-profit rides. 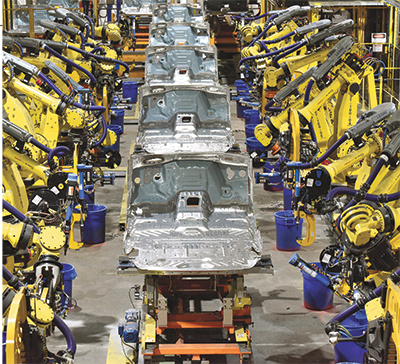 The highly automated Ford Kentucky Truck Plant shows how technology continually drives auto-production evolution. Today, Industry 4.o is making serious inroads in the auto supply chain. Looking to 2018 and beyond, the industry is impacted by numerous trends. The much publicized self-driving-vehicle age is nearly upon us, with autonomy features ever-more prevalent in new vehicles. New methods for tracking suppliers and supplies include an adoption of blockchain. And, evolving processes and materials promise safer more dependable vehicles. Here’s a look at what we need to keep an eye on. Ready for IATF 16949? As ISO/TS 16949 transitions to IATF 16949, a global industry standard from the International Automotive Task Force, automotive suppliers need to make sure they are compliant. If not, work from OEM customers may be in jeopardy. To help ensure a smooth path, industry consultants Cathy Fisher, president of Quistem, LLC, and Ed Potoczak, managing member of the Oakstone Group, LLC, have authored an article, Automotive Supplier Execs: Three Keys to a Fast, Worry-Free IATF 16949:2016 Transition. Read the full article, and tips and tricks on how to successfully navigate the transition. 3D printing could bring supply chain closer to customers. More than just supplying replacement parts, 3D printing promises much more to vehicle manufacturers and suppliers. This includes potentially greater customization in the vehicle specification and manufacturing process, reduction in lifecycle costs and relocation of the supply chain closer to customers. IoT, blockchain and more. Technology developments within the past five years involving the Internet of Things (IoT), machine learning, mixed reality and blockchain will shape supply-chain tends in 2018 and beyond. That’s according to Anant Kadiyala, director of blockchain and IoT industry solutions at Oracle, in a Manufacturing Business Technology article at mbtmag.com. Supply-chain applications include end-to-end visibility, product tracking, fraud, settlements, compliance, productivity, worker safety and delivery speed. 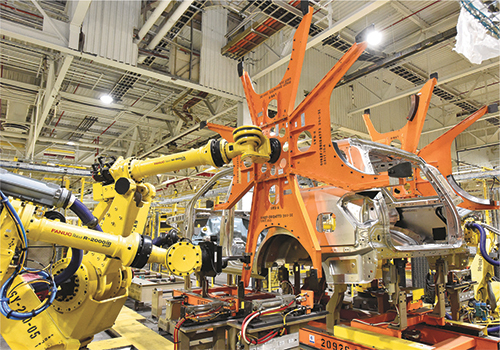 Production tallies, forecasts and supply-chain trends all will be on the agenda at PMA’s Automotive Parts Suppliers Conference, April 25-26 in Detroit, MI. To hear how such technology advances can impact metalformers and fabricators, and how your colleagues are employing these advancements successfully, read Internet of Things for Metalformers and Fabricators, in this issue beginning on page 38. And, for details on MetalForming magazine’s IoT for Metalformers and Fabricators conference, April 18-19, 2018, in Nashville, TN, visit www.metalformingmagazine.com/iot. Against this unique and shifting backdrop, suppliers will convene in Detroit, MI, April 25-26 for the Precision Metalforming Association’s Automotive Parts Suppliers Conference. Celebrating its 25th year, the conference provides educational sessions, networking and group discussion on the latest advancements and outlook for the automotive industry. It’s an ideal forum for CEOs, presidents, owners and other senior-level automotive-sector executives to obtain timely automotive-industry trend analysis; hear production forecasts that can be used to develop marketing plans; network with automotive-supplier peers; benchmark; and discuss strategic trends and changing conditions in the automotive market. Joe Langley, an economist with IHS, summarizes the IHS Automotive Light Vehicle Production Forecast, which spans more than 50 countries, 600 plants and 2300 models over a 7-year forecast horizon. Business advisor Lawrence D. Burns, Ph.D, in his presentation, New Age of Mobility, describes how the freedom and independence provided by today’s automobiles is being redefined. Autonomy promises better mobility and safety for more people at lower costs. But the implications for the automobile industry could be profound. Burns leads attendees through what that journey may look like and how to best prepare. Dan Sharkey, partner with Brooks Wilkins Sharkey & Turco PLLC, examines legal and regulatory developments as well as their impacts on automotive suppliers. Plante Moran’s Lou Longo, international consulting leader, Alejandro Rodriguez, country manager, and Daron Gifford, automotive leader, lead an interactive panel, It’s a Chain Reaction: NAFTA and Your Business. The panel discussion explores the status of NAFTA negotiations and their possible impacts on the automotive supply chain. In Automotive Lightweighting: The Past, Present and Future, Abey Abraham, managing director at Ducker Worldwide, explores the increased use of lightweighting materials driving advancements in hot forming steel, warm forming aluminum and composite molding, along with new joining methods using lasers, fasteners and adhesives. Metal-Additive Manufacturing for Automotive, a special session sponsored by MetalForming’s sister publication, 3D Metal Printing, features presentations by two industry experts. Practical Guidance from Design to Production, by Dan Skulan, national sales manager for Renishaw, shares a systematic approach to automotive design, prototyping and production that uses a comprehensive suite of technologies. Challenges and Opportunities from the E.U. to the U.S., by Jon Walker, automotive specialist with EOS, discusses how additive manufacturing can play a role in future mobility.